The Afghan Hound is one of the most distinctive members of the greyhound family. Clothed in long silky hair, and with a long slender head crowned by a flowing topknot, this dog breed's appearance is eye-catching and exotic. The Afghan Hound's ancestors were hunters in the mountains and deserts of their native land, and from them he inherited his long legs, large feet and athletic body. In the USA males 26-28", females 24-26"; in Europe and Australia males 27-29", females 25-27". 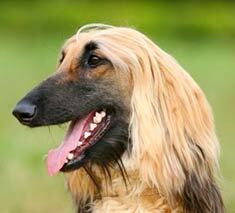 Afghan Hound males weigh 55-65 lbs, females 45-55 lbs. 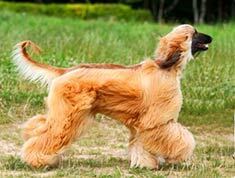 The Afghan Hound comes in a wide variety of colors which include solid black or blue, black and tan, red, cream and brindle. Some light colored hounds are self colored others have black masks and ear fringes. The Afghan Hound is a high maintenance breed and requires regular grooming and bathing. As their hair has to stay on the dog for a long time in order to grow to its full length, they are not seasonal shedders. They have very little oil in their coats so do not have doggy odor. The adult Afghan Hound has a royal bearing and may be aloof and dignified but should never be shy. With his family he can be a clown and very affectionate. They are intelligent watchdogs and do not bark just to make a noise. Training an Afghan Hound can be a challenge - they learn very quickly but then have to be convinced that there is a purpose behind what they have learned! Reward training works well with an Afghan Hound. They are sighthounds and will chase live game, so off leash exercise should be restricted to safely fenced areas. 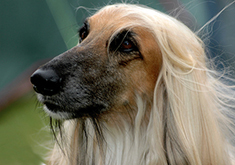 The Afghan Hound is a generally healthy breed and the incidence of hereditary problems is low. Cases of hip dysplasia, juvenile cataract and hypothyroidism do occur, but the percentage is fortunately small. The Afghan Hound can be expected to live about 13-15 years. Afghan Hounds are very easy to live with and adults are equally at home in a mansion, a townhouse or an apartment. Dogs that do not have a fenced yard in which to run will need plenty of exercise and walks to the local park. Puppies are not recommended for apartment dwellers. The beautiful Afghan Hound was originally bred, as its name implies, in Afghanistan, his long, silky coat providing protection against the cold mountain air. He is likely at least 5,000 to 8,000 years old, probably next in line after the Greyhound as the oldest dog. His original purpose was to hunt rabbits and gazelles by coursing them through the rugged terrain. What does the Afghan look like? The Afghan has been called the “king of dogs”, having a regal appearance. He stands 24 – 29 inches tall at the shoulders and weighs 45 – 60 pounds. The dog’s height at the shoulders is equivalent to the body length from chest to buttocks. The regal Afghan Hound has beautiful, long flowing hair. As a sighthound, the Afghan has especially sharp vision to enable him to detect the motion of his prey. The long, thin head allows both almond-shaped dark eyes to face forward, creating stereoscopic vision. His long legs and flexible spine allows him to chase his quarry with a very long stride. His deep chest contains a large heart and efficient lungs to help him sprint after prey, and his thin, wiry body is built for nothing but speed. His big, high hipbones and large feet help him traverse rocky terrain at a quick pace. The coat of the Afghan may be any color, but white markings are less desirable, especially on the head. Many Afghans have a black mask on their face, adding to their regal appearance. Some of them, known as Mandarins, have long facial hair that resembles a Fu Manchu moustache. Regardless of his fur color, the Afghan’s eye rims, lips, and nose must always be dark. Afghan Hounds should always have dark eye rims, lips and noses. The long hair is fine and silky, needing special care and consistent grooming. The fur on the head creates a long topknot, while the fur on the back is shorter, forming a characteristic saddle. The thin, nearly furless tail has a distinguishing curl at the end. In full gallop, the Afghan hound is something to behold. His hair streams gloriously in the wind, his head and tail held high. Is the Afghan hound easy to train? Some say these dogs are slow to learn, but mostly they are just independent. If they can’t see the value in following your commands, the simply won’t do it. In this respect, the breed acts more like a cat than a dog. A good trick is to catch the dog doing what you want him to do, then praise him as if he has discovered the cure for cancer, letting the dog think it was his idea in the first place. This dog generally ranks low on conventional tests of dog intelligence, not because he isn’t smart, but because these tests are designed to measure how well a dog obeys basic commands. The Afghan, by nature of his breeding, works independently. In the hunt, he chases very fast prey. He cannot stand by and wait for commands from his master; rather, he must think for himself and live by his wits to assure his very survival. Consistency and gentle training methods lead to the best results. Afghans don’t necessarily excel in obedience trials because of their apparent belief that they are royalty. However, by nature alone, these dogs make great lure-coursing contestants, often excelling at this popular sport. Because he may choose to ignore your commands and because of his need for speed, this is a dog who absolutely requires a fenced-in area. Afghans have been clocked at over 40 miles per hour; they can jump across 20 feet and leap 7 feet straight up. At a trot which he can maintain for hours, the Afghan travels upwards of 10 miles per hour without even breathing hard. An ideal location to exercise your Afghan is on an outdoor tennis court where there is plenty of room for him to run around, and the fences are high enough to keep him contained. The Afghan Hound excels at the sport of lure-coursing. When you are not actively exercising your Afghan, you may find that he is a bit of a couch potato. For some reason, probably because they know they shed, Afghans are drawn to upholstered furniture, where they will sprawl across the whole couch or steal your easy chair the minute you vacate it. Afghans are accomplished counter-surfers, and their tall bodies may even be able to swipe things off the top of your refrigerator. They’ve been known to open drawers to get to whatever they have decided ought to be theirs. Careful puppy-proofing is required before you bring home this intelligent dog. Is the Afghan good with children and other pets? The Afghan’s suitability with children is not consistent from dog to dog. Some are great with children, while others will not put up with teasing, tail-pulling, and the other annoying things children are prone to do. The Afghan will do well in a home with other large pets, but they generally think that smaller pets are prey. The prey drive is so strong in sighthounds that it is difficult to convince them that cats, bunnies, and even small dogs are not placed in the home simply for their hunting enjoyment. These dogs often served a protective function historically, with the ability to catch and bite through the spine of a leopard. The prey drive of any dog is tough to extinguish, so having an Afghan is likely not a chance you will want to take with your precious furry friends. Early socialization is extremely important, as these dogs are large, strong, and stubborn. If you allow your Afghan to grow up without spending the proper amount of time learning about others, you will have an unmanageable, nearly feral adult dog. However, with patience and good training, you will have a comical, faithful friend. The Afghan’s suspicion of strangers can make him a great watchdog to protect your home, although he is not likely to attack intruders who aren’t scared off by his large size and deep bark. How hard is it to groom an Afghan? Afghan Hound puppies start out with a smooth coat. When you first bring home your Afghan puppy, he will have a smooth coat, which will gradually fall out over the first three years. At about 1 year, the long adult coat begins to come in, and the combination of the two coats can be a nightmare. Once the adult coat is fully developed, weekly baths and daily brushing are the norm. A snood or protective head covering may be used to keep the dog’s long ears and topknot out of his food and water. The long coat serves an important protective function, trapping air to keep the dog cool. Clipping the coat in the summer really does not make the dog any cooler. Afghans shed their coats in the fall and spring, and after serious illnesses. In addition, unspayed females will shed after each heat cycle. What health problems should I watch for? Afghans are generally a healthy breed, living about 12 years. However, they are prone to allergies. They also have a relatively low tolerance to pain, which is why they are not great with rambunctious children. In addition, because of their low body fat percentage, they are very sensitive to anesthesia. Your vet must carefully monitor an Afghan undergoing surgery to prevent an overdose of anesthetic agents. As with many large breeds, Afghans may develop hip dysplasia. Before purchasing a puppy, ask the breeder to show you certification from the Orthopedic Foundation for Animals (OFA), your guarantee that the parents’ hips have been checked and found free of defects. 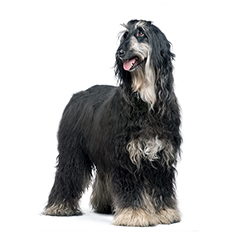 If you have three to four hours a month to spend grooming your dog and can tolerate a dog who is difficult to train, you may be interested in an Afghan hound. However, if you want a dog with low exercise needs who will acquiesce to your every wish, you may want to look elsewhere. 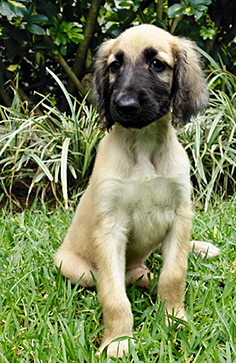 Find Afghan Hound Puppies with our Free Breeder search!